Bowie High School's musical tribute to Michael Jackson was a fabulous show last weekend (and a photography challenge). It was colorful and very well done.The Men's choir was awesome singing Man in the Mirror...my favorite song. What was really touching was enjoying the atmosphere, the celebration of hardwork and 27 Seniors who performed together for the last time...it reminded me of the good ole' days with the Class of '82, our last parade, our last half-time show, our last everything. We had been together for 6 years in the same school and you could have never told us in the Spring on 1982, that we'd probably wouldn't talk to each other for nearly 25+ years, but that's exactly what happened. Maybe we would have stayed in touch if long distance was free, there was e-mail and by golly Facebook and Twitter! The two new mommas to be that I had the honor of photographing back in August in this post have had their babies. It's been a tense two weeks praying for both of them and trying to get updates. One birth went pretty much exactly as planned, the other had some disappointing challenges but both babies are here and healthy. Thinking of these two new mommies, I've been thinking about the 6 births that I have given...have I scrapbooked them...well, yes at least five of them but only from a storytelling perspective for the child's benefit. To births were extremely difficult, one I did write out in long hand for therapeutic purposes, but I'm not sure where it is. I guess this is something I should put on my to do list...someone in my future may care about my birthing/motherhood thoughts. Here are my thoughts on a layout I prepared for an article I wrote a few years ago. It's still one of my favorites and one of the very few 100% digital pages I've done. I am very fortunate that my GG Grandmother's house is still standing and that we still have family gatherings there. Recently, when we were all gathered there for my Great Aunt's funeral, we found a new scrapbook. One particular party that was held in the house was my Great Grandparent's 50th wedding anniversary in 1965. I study these photographs for the little details, how the room was decorated, the china, the punch bowl, glassware and etc. Here's one of those photos that I've seen more than a dozen times. What I never noticed before is that I am the infant my Dad is feeding to the right! LOL!!! Photo of blooms in my front yard. Our summer has been full of excitement thus far...how about yours? Joseph really grieved for his brother Jonathan on Thursday and Friday, while Jonathan was off visiting with his cousin for a few days. It really was a pitiful sight. He had his face painted and the "monster" was really reflective of how he was feeling...angry at the world because of his grief. A few people I know are grieving the loss of loved ones and I received these journaling tips and prompts in the mail today and I think they can really help some of you. I'm going to use them to help me through my recent divorce from my employer of 11 years. Give this form of therapy a try and let me know how you felt about the process. I recently received these tips by mail as a follow-up from the Montgomery County Maryland Hospice program for when my husband’s grandmother passed away. Try working your way through writing out responses to these prompts and a photo to your entry and you’ll have the start of any extremely valuable memory album. My favorite home decor to make are scrapbook wall canvases. So, by popular demand, I'll be giving hands on instruction on how to make your very own this Sunday afternoon in my scrapbook studio. I have room for five more people, shoot me an e-mail if you'd like to attend and I'll send you a supply list. Jerin and I watch "What Not to Wear" just about every Friday night. We fantasize about being a mother/daughter makeover on the show. Well Jerin got to makeover her Grandmother ("Memaw") during our vacation. My mom picked out the clothes, but Jerin did everything else including scouting out the photo shoot location. I think they both did a fabulous job. Here's Jerin checking out her Memaw the day before the makeover. Jerin did a fabulous job flat-ironing Memaw's super duper curly hair (her childhood nickname was curly). It didn't last long though, the curls were right back the next morning. Now the poses...that's all Memaw's doing. But isn't Jerin's Photography fabulous! Jerin really knows how to accesorize an outfit too! Our Portuguese Water Dog, Sierra even got in on the action. Fabulous photo shoot Jerin, you have real potential...now makeover ole' mom and dad too! also see my new webpage of photography links located under Resources in my side bar. Some great photos of Portuguese Water Dogs...we love our Portie. 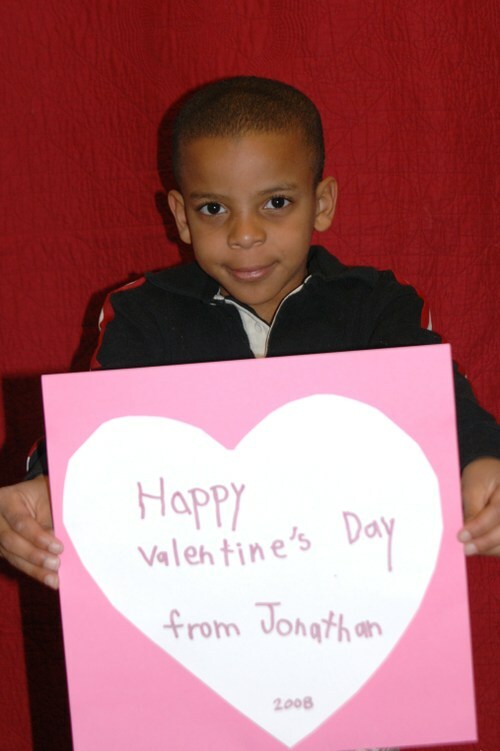 I printed this photo out in wallet size and Jonathan gave his classmates a very personalized valentine...I hope one that won't get thrown away. Got this idea from either www.photojo.com or some scrapbooking newsletter can't remember where. It took a whole 15 minutes to do this project and cost me three sheets of photo paper! How's that for when the kid tells you 10 minutes before bedtime that he needs 27 Valentines!